Indeed, at the market I can get very fresh fish; i’m always suspicious of pre-packed fish at the supermarket. So yesterday I bought catfish. Very firm and tasty! 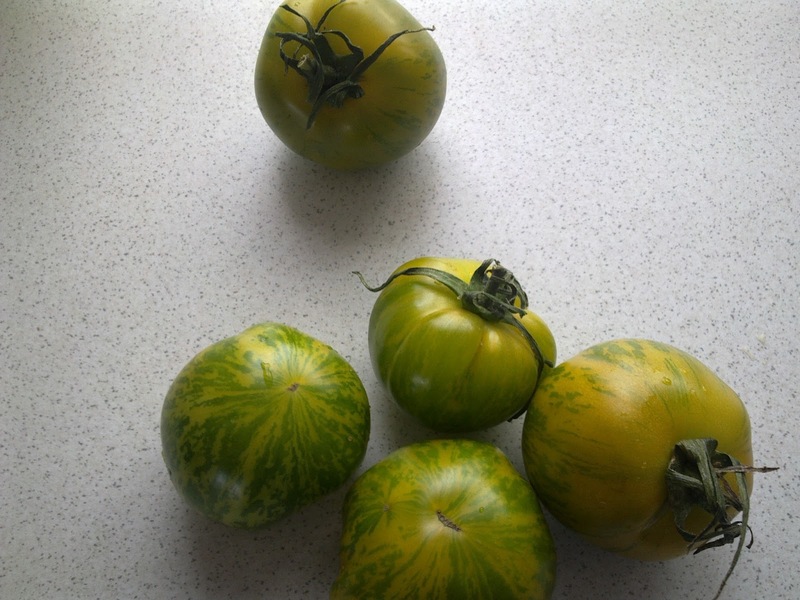 While at the market I also found green tomatoes (or green zebra). It changes from its red cousin although they don’t really taste different. It’s sweet and juicy and nice to look at! I served Roma tomatoes in another bowl for colours and experiment! Put a few very thin slices of butter in an oven dish. Put the fish on top and distribute a few other thin slices of butter on top. Cook in the oven for 30 to 40 minutes at 85 to 90°C. The cooking times depends on the thickness of the filet. 10 minutes before the end, mix the ginger, the red hot pepper, the olive oil, and the sea salt flakes and spread on the fish. Put back in the oven for the remaining 10 minutes. *You can replace butter with olive oil. 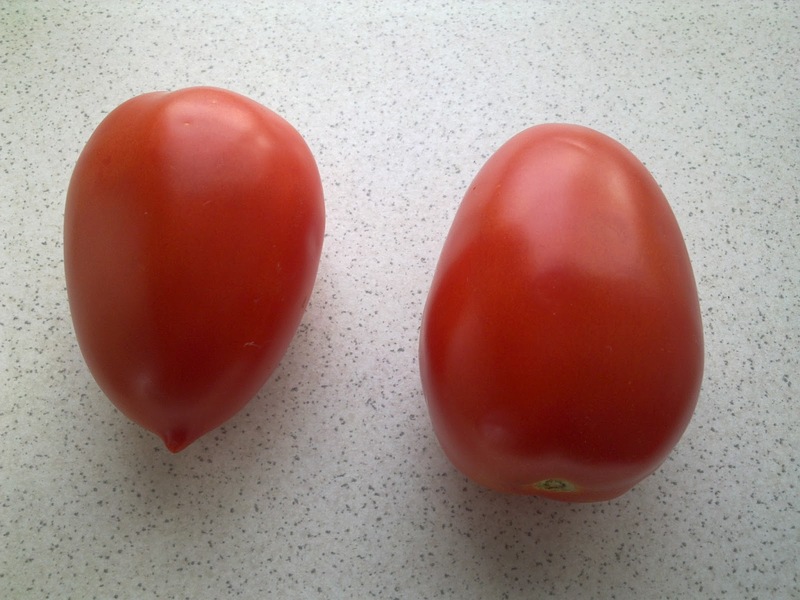 Serve with two tomato salad: one green, one red. Simply season them with sea salt flakes and olive oil. Those cookies are really easy to make. They will taste like Brittany if you ever went there. It’s crucial to choose great ingredients. The list is simple and if you choose mediocre ingredients, you won’t have anything to hide or cover the disaster. The butter is the choice ingredient. 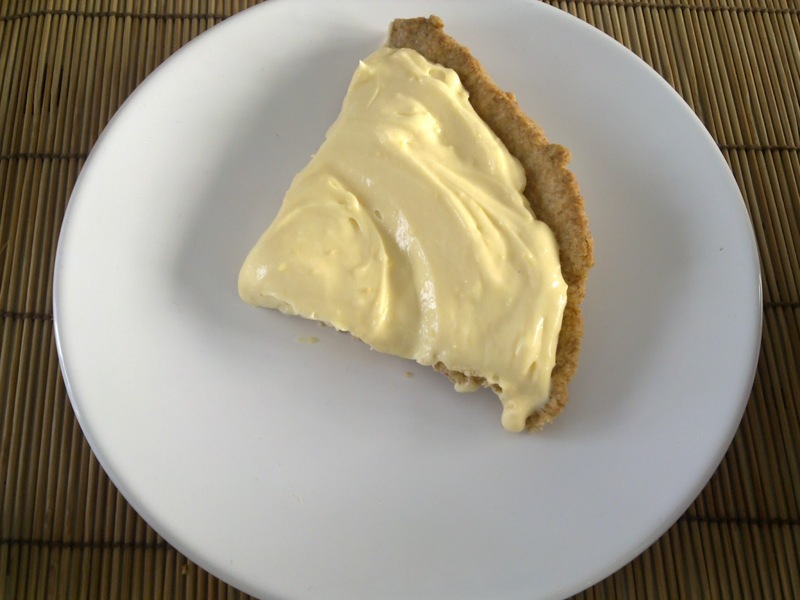 Try to find raw butter for a better and true taste. For the flour, choose half-whole organic wheat flour, if possible stone grounded. Choose Guérande salt or grey sea salt. In a stand mixer, mix the other half of unmelted butter with sugar. Add the melted butter, the egg, then the salt. Don’t overmix. Mix the flour with the baking powder or soda and add to the previous mix. Leave to rest 30 to 45 minutes. Spread the dough to get 3 to 4 mm thick and cut it with round cutter. Cook in a pre-heated oven at 240°C on a tray covered with silicone or baking sheet. Cook for about 7 minutes but take the cookies out as soon as they’re golden. You can freeze the raw dough as a roll and cut thin slices that you’ll cook a little longer. 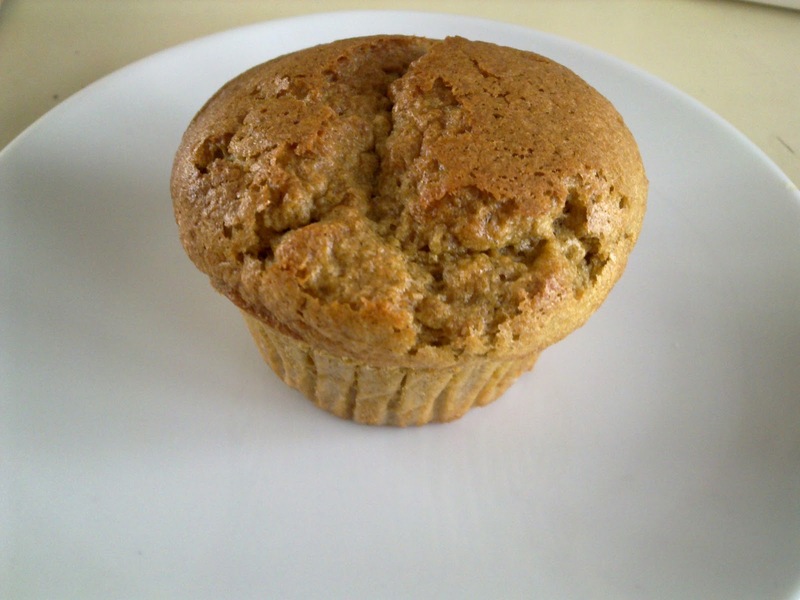 You can make a gluten free mix by using buckwheat flour instead of wheat flour. I’m afraid you won’t get the same satisfying and authentic result by replacing the butter* with anything else. *The butter is lactose free (all the lactose stays in the whey. Butter is very good for you health if it comes from a good source. P.S. 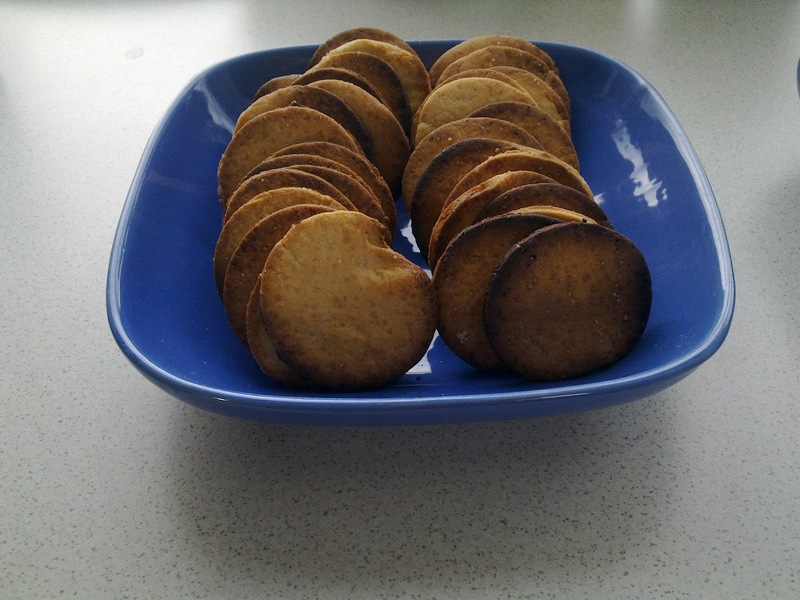 I’ll gave away those cookies on May 19th 2012 in Huy for Jamie Oliver’s FoodRevolution Day! Drain 375g of chickpea and rince until there’s no foam coming from it. Heat 4 tbsp of olive oil in a frying pan on low heat and cook a minced onion until golden. 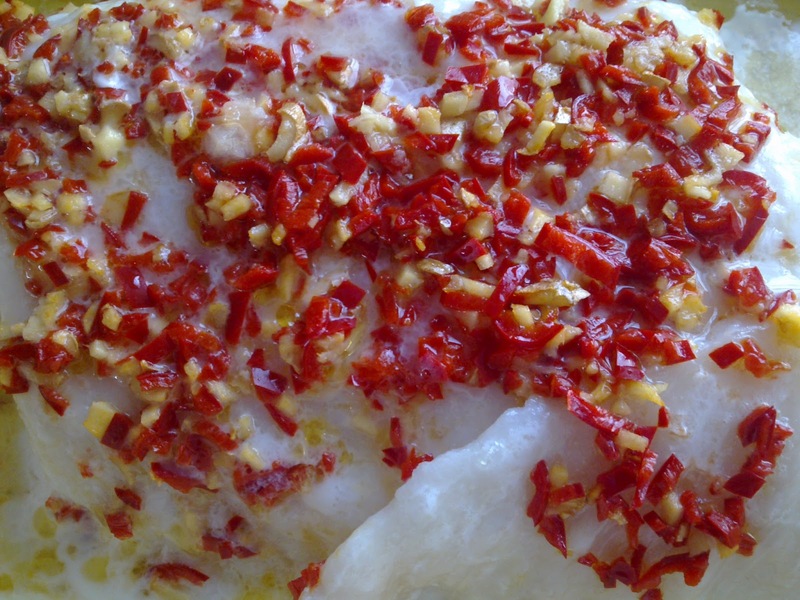 Add 7 garlic cloves (peeled and minced) with 2 hot peppers (deseeded and minced). Cook for a few seconds until fragrant. Leave to cool. 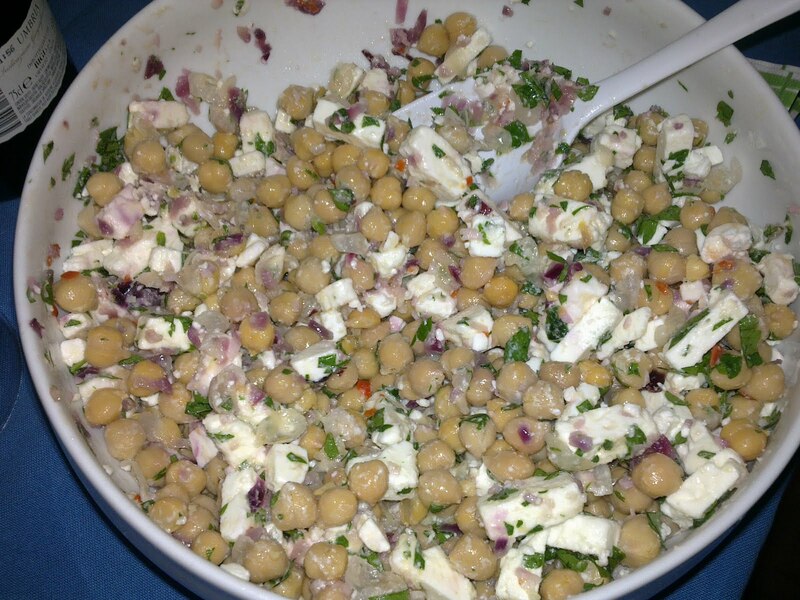 Mix the chickpeas with the cold onion mix (and the cooking oil that go with it) and with 375g of crumbled feta (or cut in cubes), minced flat leaves parsley, ciseled fresh mint, the juice of 2 lemons. Add 2 tbsp of olive and toss. You can make it without the feta and add olives instead. 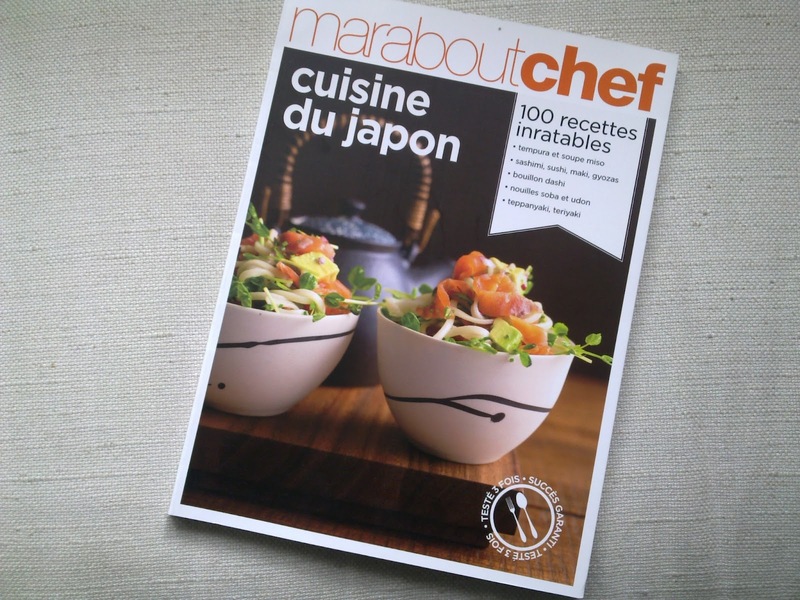 I got this book in French but in English you can get it too: “Japanese” ACP Magazines Ltd.
To test the recipe from this book, I choose teppanyaki. I don’t have a barbecue or a real teppanyaki but my cast iron skillet will do perfectly. The recipe suggest using shrimp and chicken along side the beef but I only used beef. 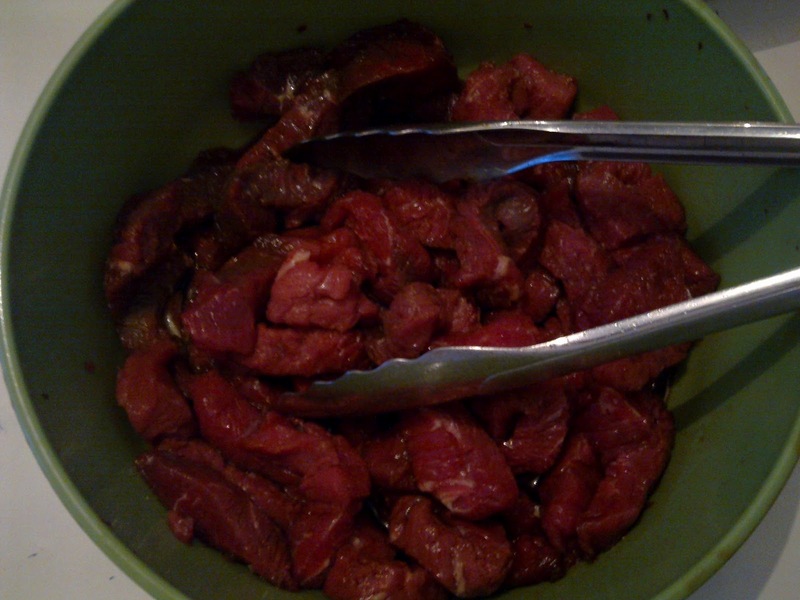 Mix the beef, soy sauce, garlic and hot pepper. Leave to marinade at least 15 minutes. 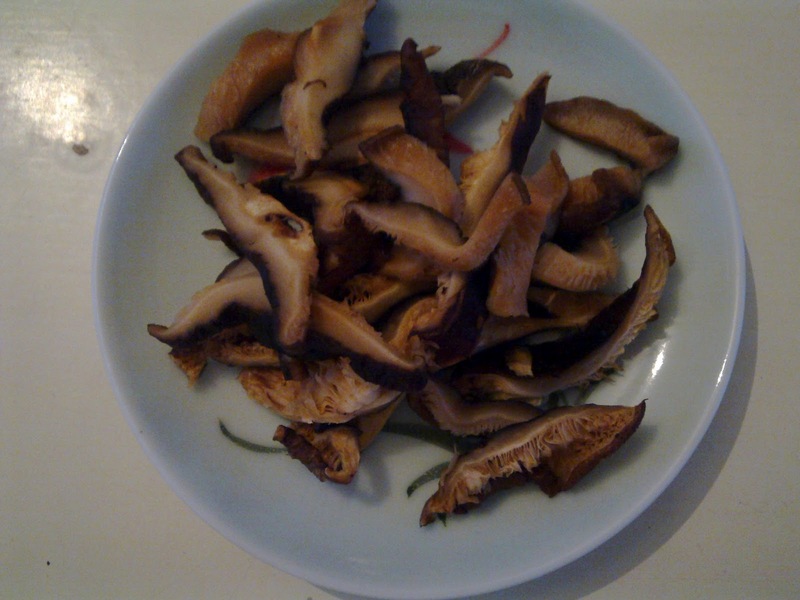 Rehydrate the shiitake mushrooms about 15 minutes in cold water then cut the foot. Slice. Heat you skillet and add a little sesame oil (spread with towel paper). Grill the peppers until soft, grill the zucchini skin side up until golden, melt the onions until golden, and do the same with the leeks. 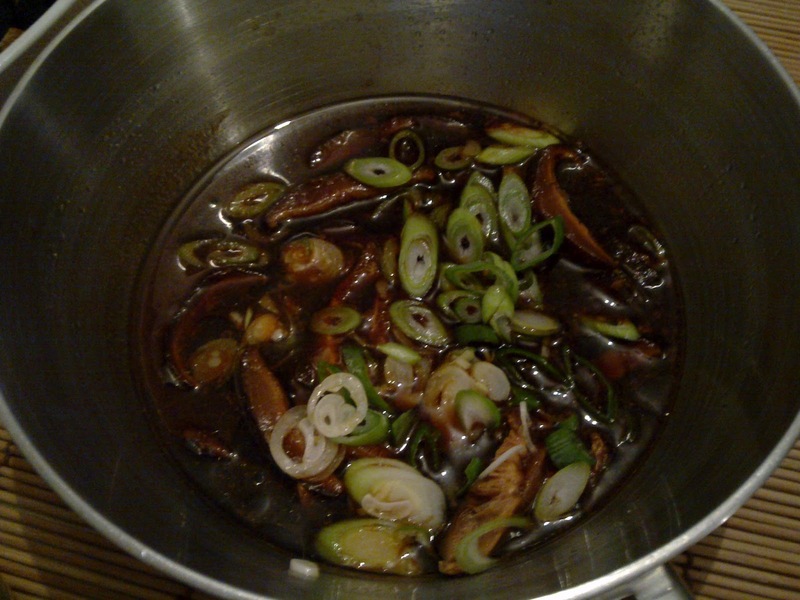 Mix the ingredients for the sauce and heat slowly until sugar is mixed in. Add the mushrooms and the scallions. Take the meat out of the fridge 10 minutes before cooking so it stays tender after cooking. Grill the meat on the cast iron skillet, on the barbecue or teppanyaki. Serve the meat with the vegetables and the sauce in an individual bowl. If you can’t go without, serve with round Japanese rice. If you have an electrical plancha/teppanyaki/grill, serve this with the shrimp and chicken (marinated with the beef) and let each guest cook as he/she wishes. 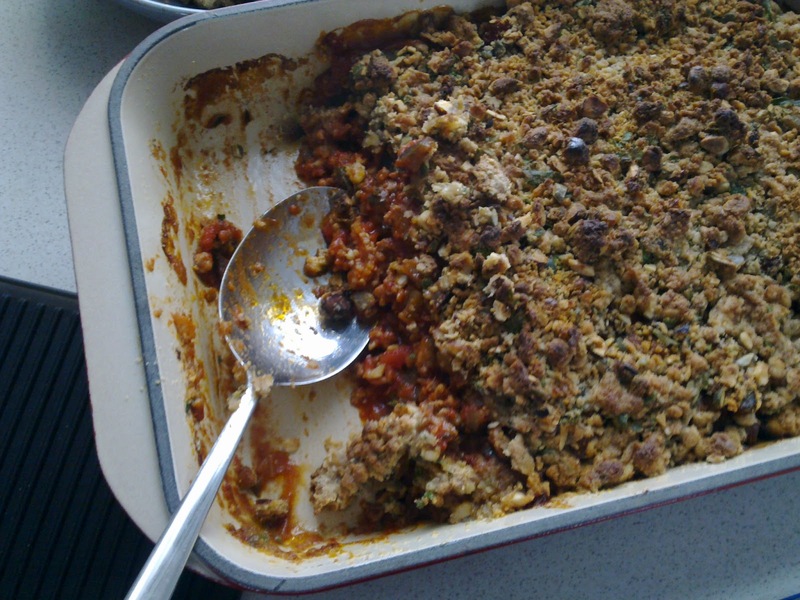 This is a great recipe, easy to make but that you’ll have to prepare well in advance. We made it with mackerel at Christmas and ate it as a condiment with rye bread and sour cream. 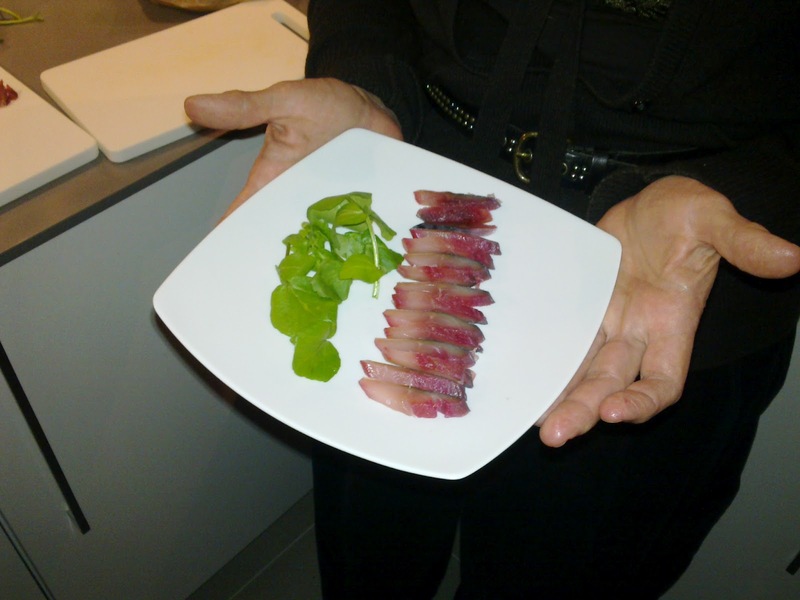 In this recipe, I made it with cod filets wich are thicker then mackerel and so not as salty. I’ve found this recipe in Donna Hay’s magazine. Donna Hay is Australian and has a way to make cooking simple. The fish is pink because of the beetroot. -very fresh fish. Make this recipe the day of your purchase. Mix the pepper grains, parsley (chopped), sea salt, sugar, grated beetroot, and vodka. Wrap the fish tightly and put on a plate. On top, put a smaller plate with heavy objects. 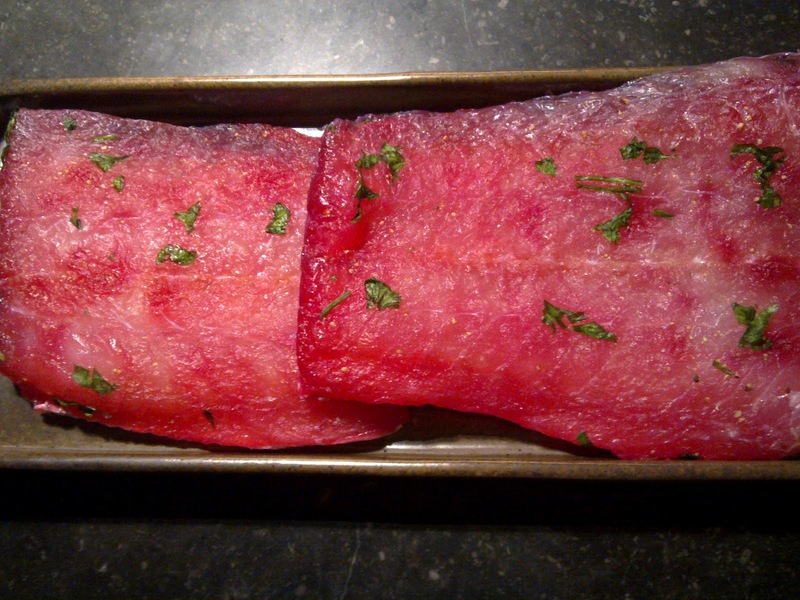 Leave in the fridge for 36 hours, turning the fish upside-down every 12 hours. Unwrap the fish and brush the salt. Rince well, dry with some paper towel. 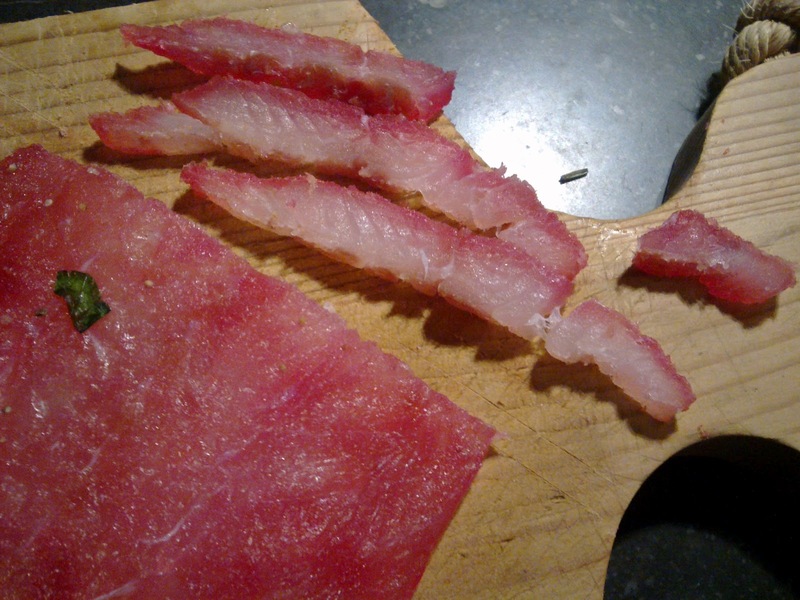 Cut the fish in thin slices. Mix the sour cream with the wasabi and horseradish. Taste and add some more wasabi or horseradish if you like but don’t add salt as the fish is salty enough. Serve the fish with the cream, watercress, rye bread slices, freshly ground pepper and a few drops of olive oil. It’s delicious in or with a salad of beetroot, kohlrabi and lamb’s lettuce seasoned with grilled sesame oil. 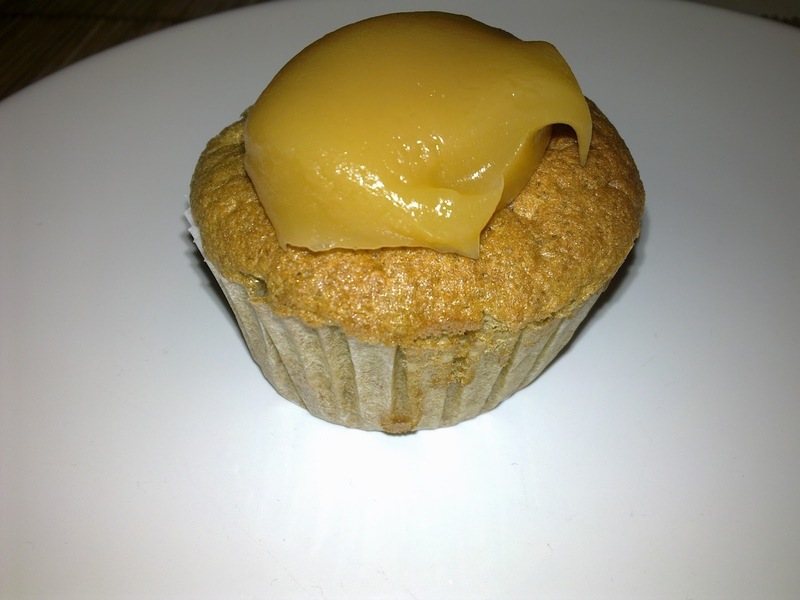 This recipe is inspired vy a new cookbook I got recently: La Tartine Gourmande. I will write about this book later, but first: the recipe! The quantities are for 8. 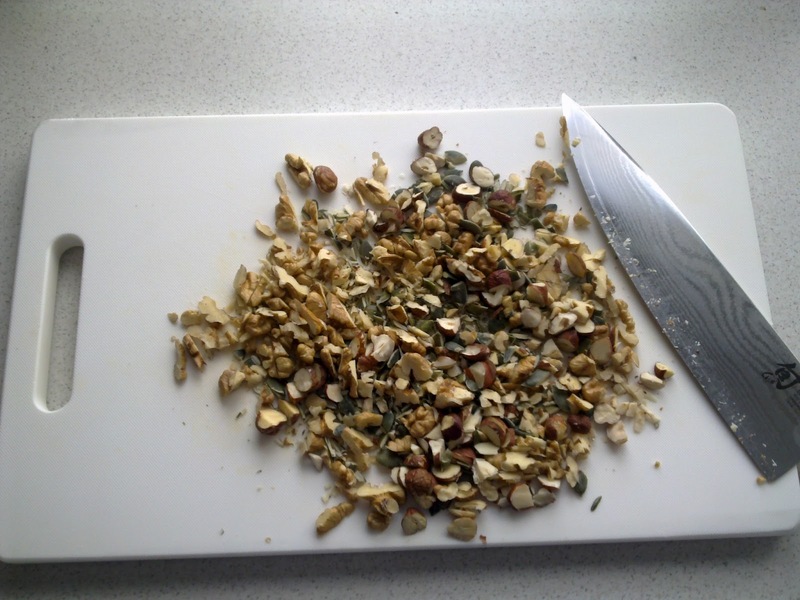 Tchop the walnuts, hazelnuts and pumpkin seeds. 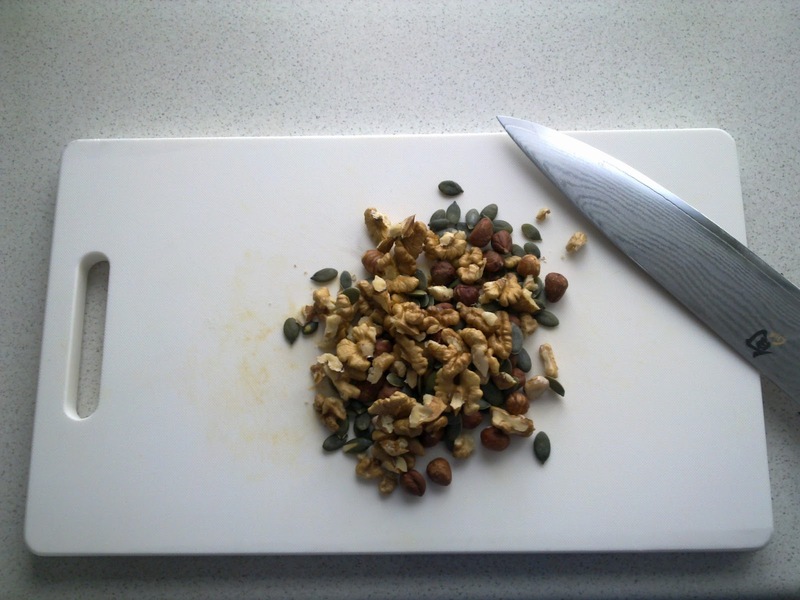 Mix all the crumble ingredients with your fingers or a pastry blender to get a sandy mix. Refrigerate. Turn on the oven at 200°C. Heat a little olive oil in a sauté pan on medium heat. Cook the onion, the celeri and the caraway for about 4 minutes. Add the garlic, leave to melt for 2 minutes while mixing. Add the grounded lamb and let it brown for about 5 minutes while turning so it’s not too chunky. Add the tomatoes (cubes and paste) and leave on high heat for 3 minutes. 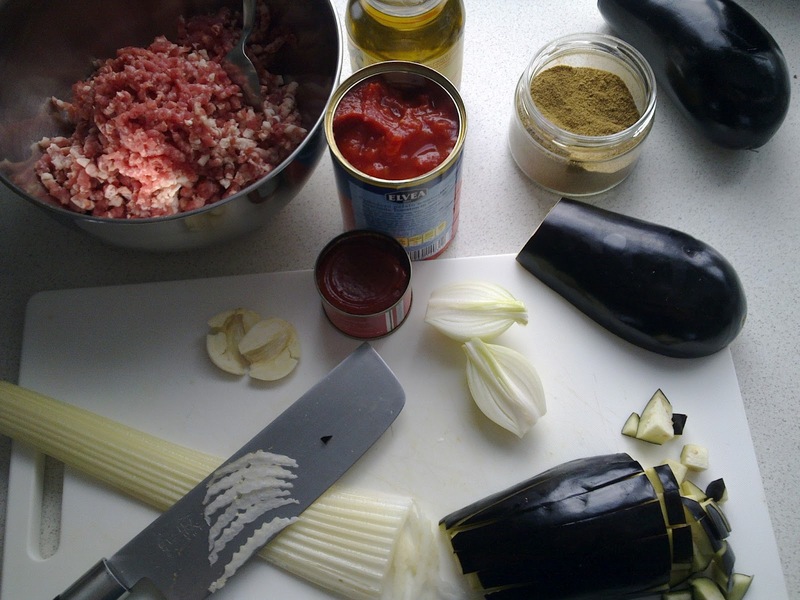 Add the aubergines and the sage, lower the heat and leave to simmer 30 to 35 minutes. 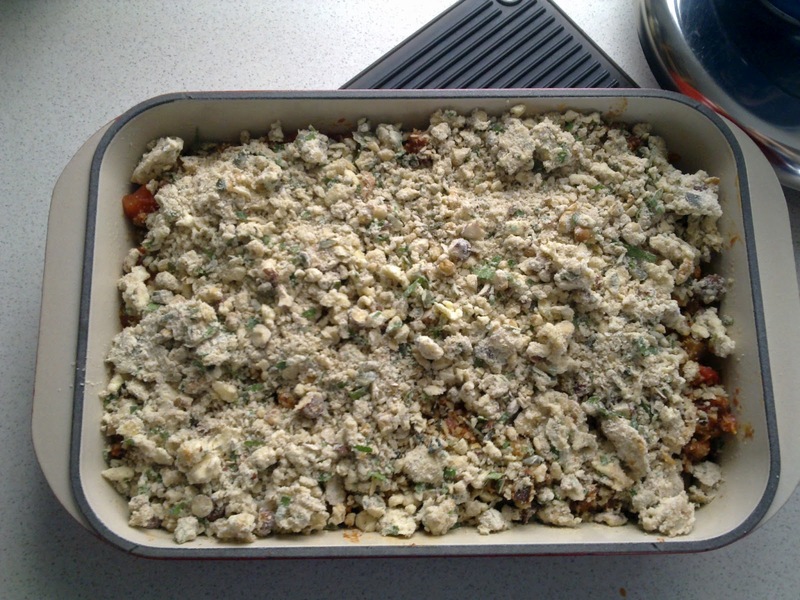 Oil an oven-proof dish and pour the meat mix in then add the crumble on top. 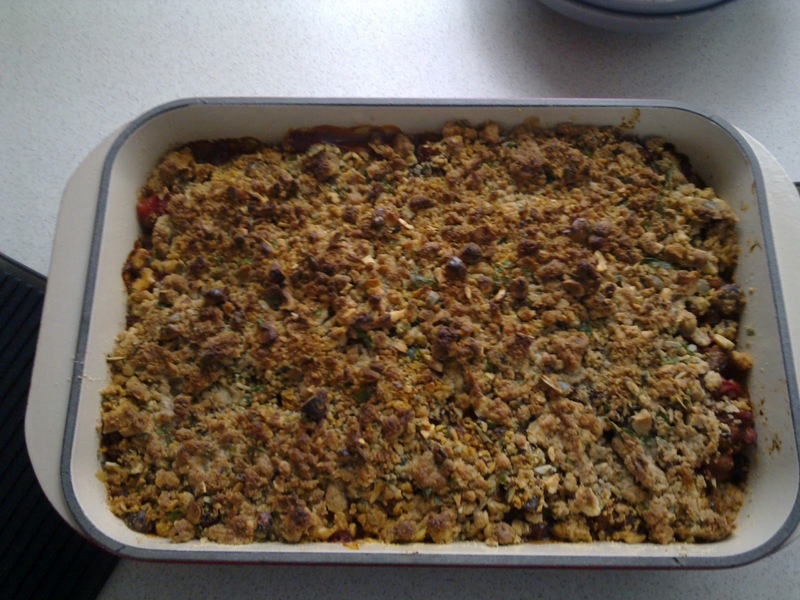 Cook in the oven for twenty minutes until the crumble is golden. Mix all of it except the oil that you’ll pour a little at a time while whisking. This meal is great as you can prepare it in advance. you could even freeze it. It’s so delicious, it’s really comforting. 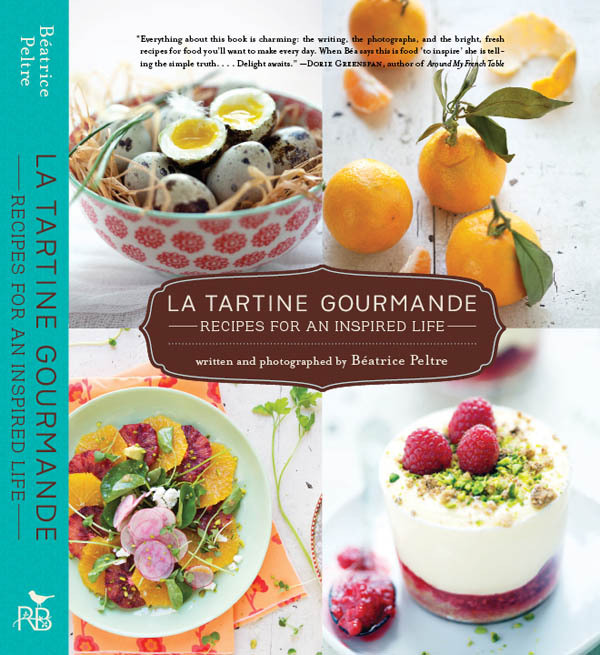 The book “La Tartine Gourmande” is written by a blogger: Béatrice Peltre. Béatrice is French but she lives in the US and wrote the book and the blog and English. She’s also the photographer. I tested several of her recipes and there are still a lot that are waiting for some time to get tested! The pictures, as the recipes, are very fresh. I think anyone who loves cooking should have this book! 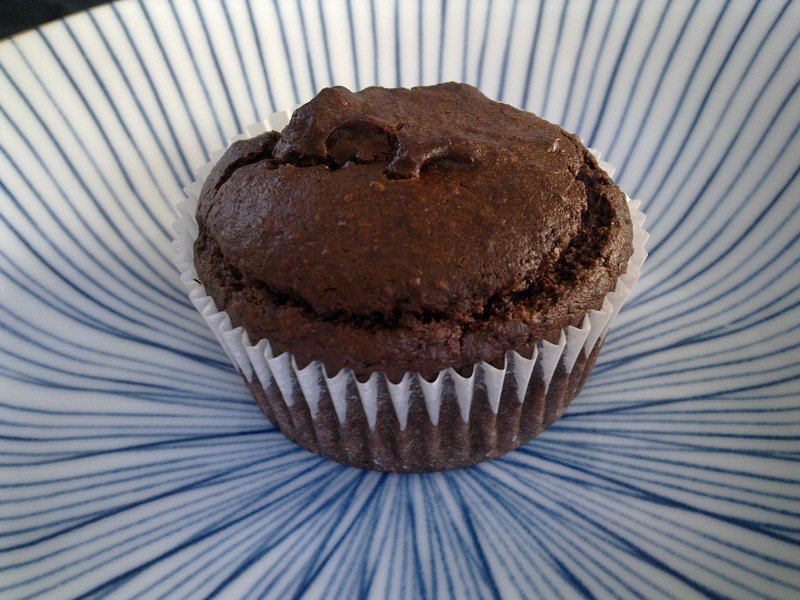 I found this recipe of a vegan cupcake in the Food&Wine* magazine. I was curious to try it as the replacement for eggs and dairy seemed, for once, interesting. Indeed, it’s been replaced by avocado and coconut oil. The result is great! The cucakes stayed soft and moist for several days (well 3, we couldn’t hold any longer) which is’nt the case with most classic cupcake recipes. 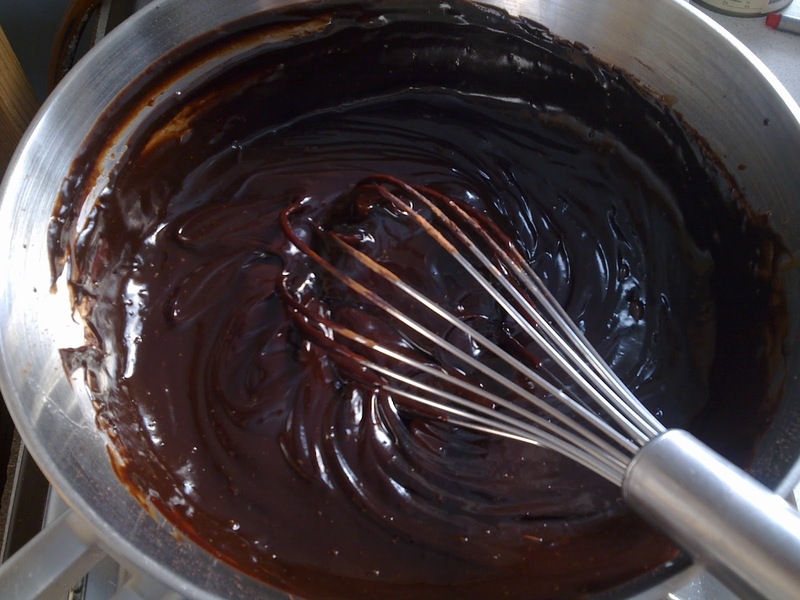 The chocolate ganache is very dangerous for chocoholics: it’s easy to spoon and would be great on bread! 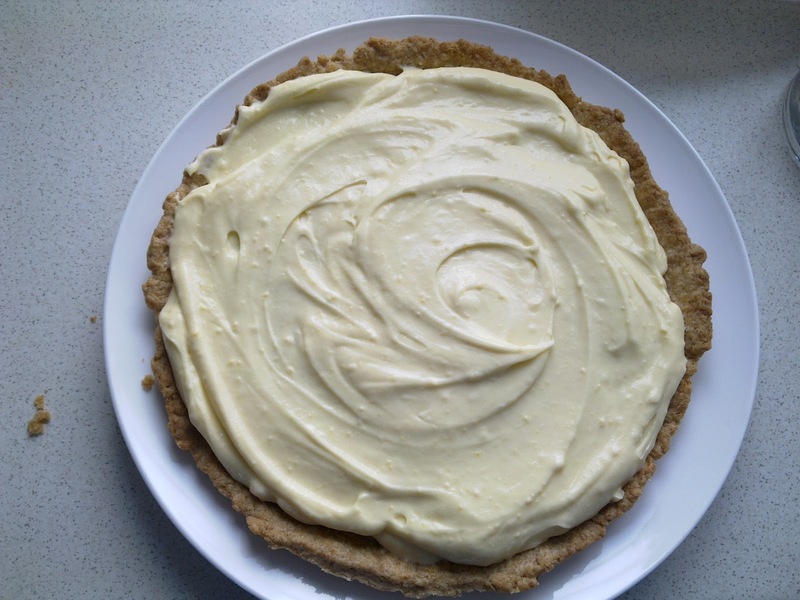 Frosting : In a bowl, mix the kuzu with the coconut milk until the kuzu is dissolved. In a pan, whisk the agar-agar and the water. Bring to boil and leave on low heat for 4 minutes. Add, still whisking, the maple syrup, cocoa powder, and salt. Whisk until smooth. Add the kuzu-coco mix and leave on low heat while whisking for about 5 minutes. It will start to thicken and look like pudding. Take away from heat and add the chocolate chips, coconut oil, and vanilla extract. Mix until smooth and glossy. Pour into a bowl to cool, cover, and leave in the fridge at least 2 hours. 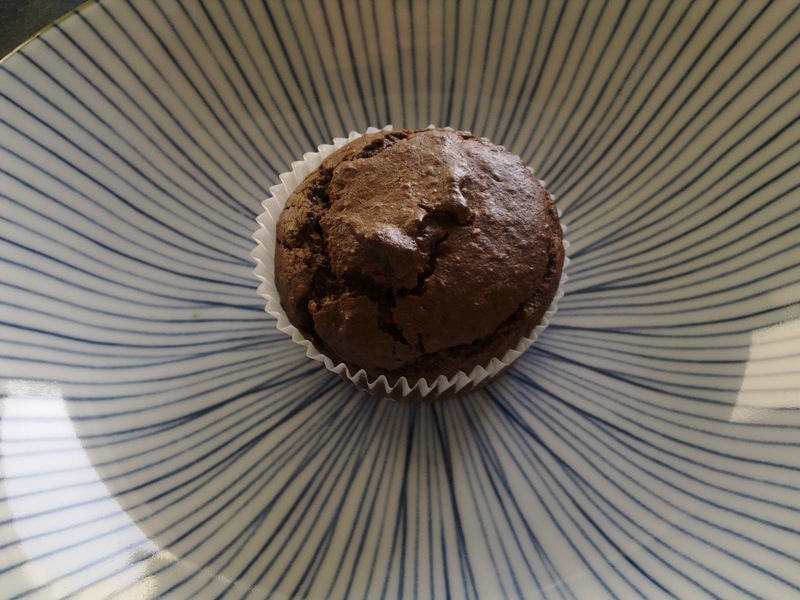 Line the cupcake/muffin tin with line papers. Sift the flower, baking powder, baking soda, and salt. Blend the peeled avocado so it looks like cream. 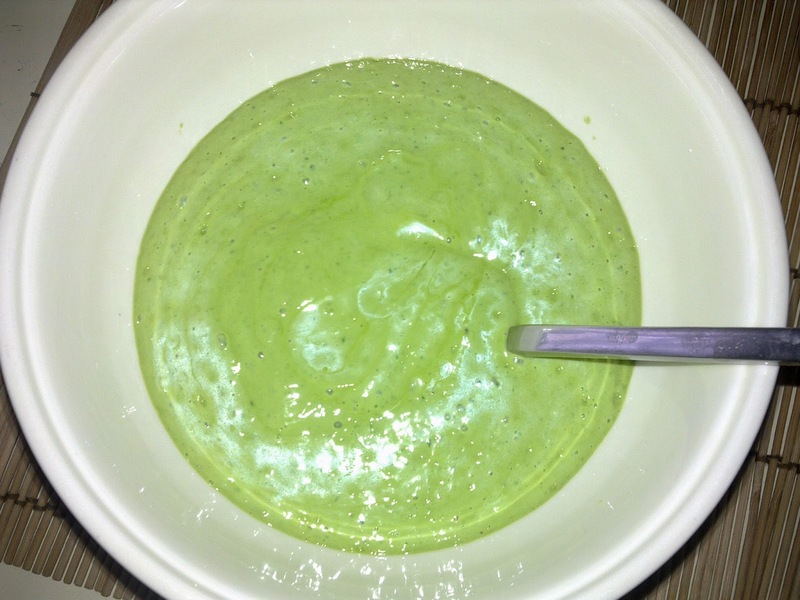 Leave the avocado in the blender or food processor. In a pan, mix the cocoa powder in the coconut milk on medium heat. Don’t stop whisking for 2 minutes until bubbles appear. Add the cocoa mix to the avocado in the food processor, add the maple syrup, coconut oil, and vanilla. Mix while scraping if necessary. Add this wet mix to the dry mix and combine without over-mixing. Pour into the tin and cook 25 minutes in the oven. Leave to cool in the tin for 15 minutes then place on a cooling rack. Use a stand mixer to mix the forsting until it’s spreadable and creamy. Decorate the cupcake and serve. *Food&Wine March 2012: recipe by Sera Pelle. *Kuzu is a root starch with some strong thickening power. 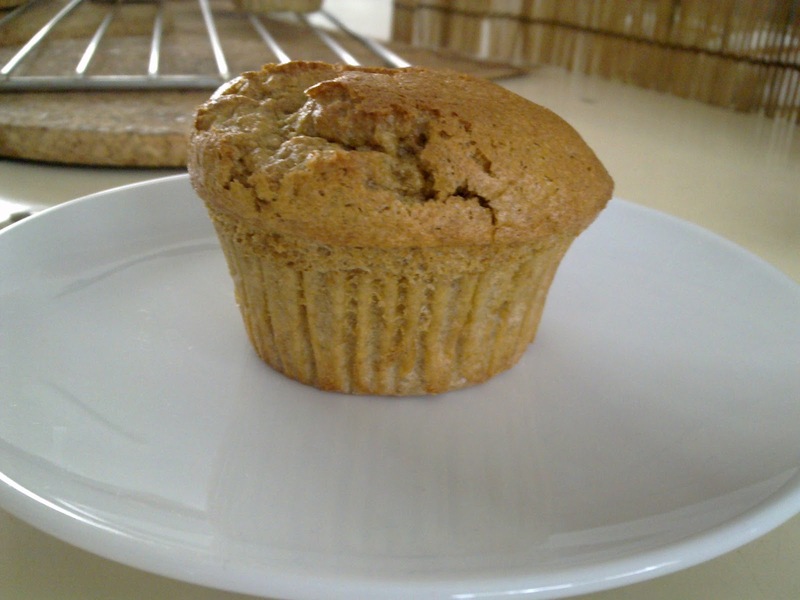 *Spelt flour is tastier, different and more interesting to use here than wheat flour. *Agar-agar is a seaweed that replaces animal gelatin. *Look at the ingredients list of your chocolate chips to be sure it’s vegan. and that’s it! You can add a little water if the soup is too thick. if you like it, you can add 1/2 a garlic clove. My garlic is so strong at the moment, I passed on it! 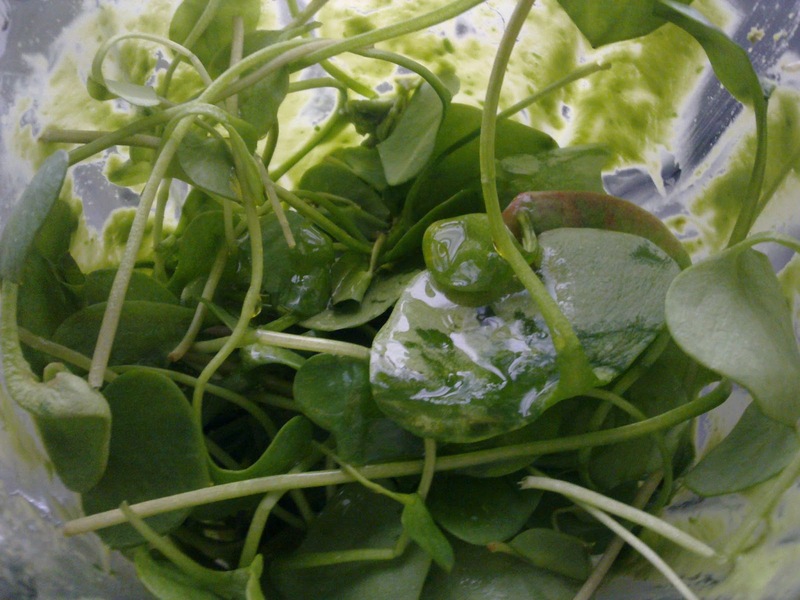 You can replace the purslane by young spinach, chervil, lamb’s lettuce. I first tried this soup when I was a trainee at Tan restaurant in Brussels. This restaurant specialises in living food served either raw or slowly cooked at low temperatures (dehydration, low temperature oven, steaming…). It was a great experience to learn new techniques and new ways to serve food, very different from what you learn at cooking school! All the ingredients were organic. The vegetables were the centre of the plate though they serve meat and fish. This soup was serve with homemade Essene bread (often flavored with dried tomatoes and rosemary). On top of the soup, you can add a little shaved carrots, beets, and some sprouts. The avocado is rich but super healthy, full of antioxidants and fibres. It’s great for the skin, the liver, and to feel full. The purslane is rich in omega 3 fatty acid so this recipe is perfect as those fatty acids don’t like heat. You should buy it as fresh as you can and eat it the day of purchase. I’m sure you noticed I love lemon! Especially in desserts! I wanted a cherry pie and the baker didn’t have any so I decided to make some myself. I made a brisée dough, I added cherry jam with added sugar. It was so good I didn’t have time to take a picture. So I had to make another pie. 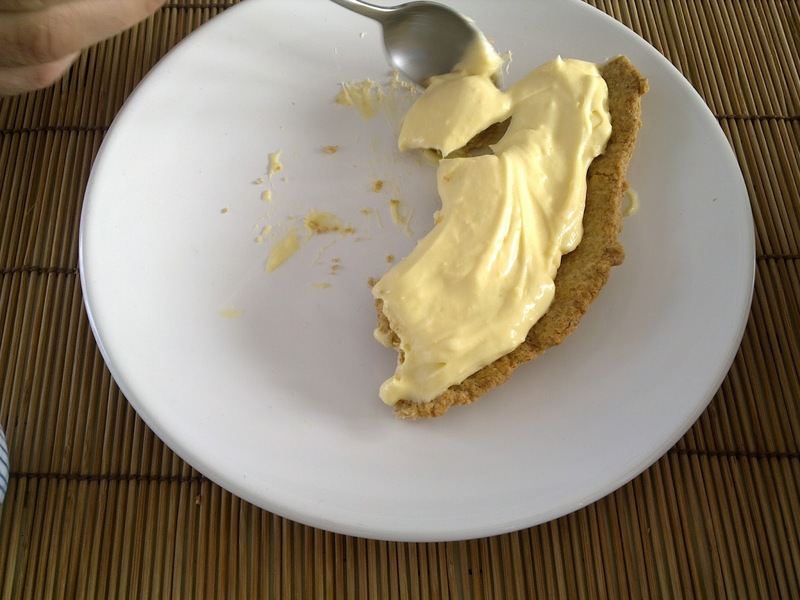 I used the same base but covered it in lemon cream. Whip the butter with the salt. Add the water and whip some more then add the flour and mix with a pastry blender without overworking it. Form a ball, wrap in film and put to rest in the fridge for 2 hours. 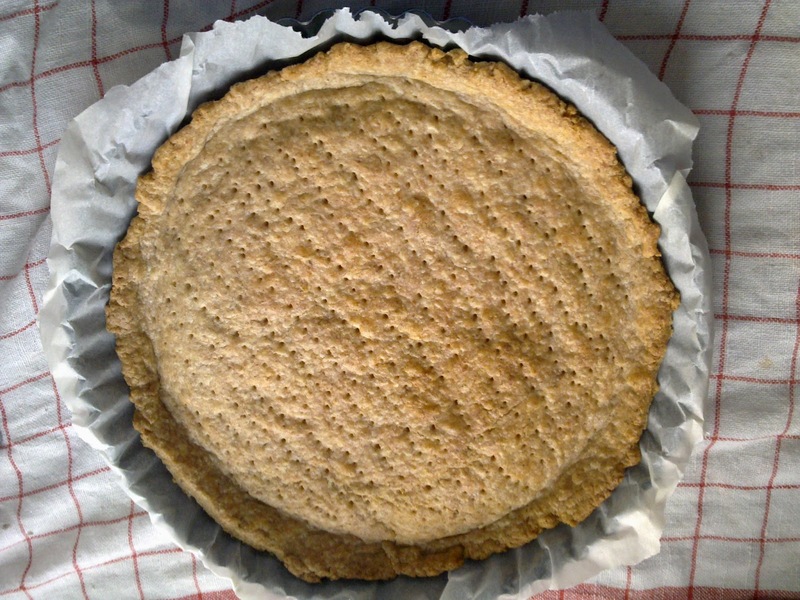 Roll the dough and transfer into your pie tin covered with cooking parchment. Use a fork to prick the dough all over. Cook in the oven at 180°C for 15 minutes. You can use small ceramic balls so the cooking is even and the dough doesn’t make “bubbles”. In that case, cook it 10 minutes with the ceramic balls then 5 minutes without. Cook the dough 10 minutes, add the cherry jam on top and cook for 10 more minutes. It’s not cherry season and the cherries bathing in sugary syrup isn’t appealing to me so I found a great no added sugar jam (100% fruits). It was delicious and well paired with this dough. Bring the lemon juice and the zest to boil with the agar-agar and half the sugar for 3à seconds. Beat the eggs with the rest of sugar until white. Pour the boiling liquid on the eggs while whisking. Pour back into the pan and heat until the first bubble. Take away from heat and pour over the butter. Mix so the butter melts and mix with an electric mixer. Leave to cool, put in the fridge then mix again. Spread on the dough and serve. This cream is way better on its own or with some sablés cookies. The pie dough is best with the cherries! 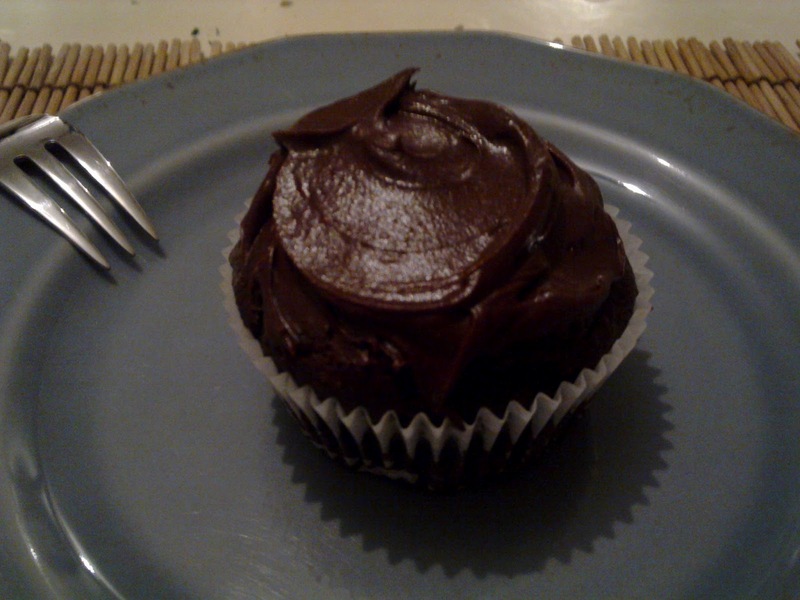 First cupcakes are delicious, light in the mouth and so cute. Second, it’s easy to make. If you don’t eat all of them at once, it’ll still be good the next day but don’t be afraid to freeze it. Sift the flour, the baking soda, the salt and the sugar. Beat the yolks with olive oil, lemon juice and the zest. Beat the whites to obtain firm peaks and incorporate delicately to the mix without over mixing. Pour in 8 cupcake tins with cupcake paper cups inside. Cook for about 25 minutes until golden. The blade of a knife should come out of the cupcakes dry. Here I was lazy, I used ready made lemon curd but the homemade one is even better and you can lick the whip and the bottom of the pan for the effort (you’ll need good biceps)! fresh and crunchy raw vegetables for all next semester!